Having just had an old slide of mine successfully identified, i would like to know more about this car. I have read through untold threads regarding Bill Sadler and his cars, but as yet, no reference to this one. Would be interested in contacting Bill for my research if anyone can help also. Anybody care to chip in?? Also, still trying to identify this one. Someone suggested an Allard, but looking at the badge, i dont think so. I believe that is the Sadler Mk2, Chevy powered. If I am identifying it correctly it was the car that Sadler raced himself In England that won the Brighton Speed Trial in 1957 according to the book "Vintage American Road Racing Cars 1950-1970" by Pace/Brinker. The car is featured on page 112. Mmm. interesting. I would say that this particular circuit looks American...possibly Nassau? And from looking at the 1st page of this report by "Sports Cars Illustrated", looks like a MK3. From what i can make out, it had a Chevy 283 watercooled V8, with a Morris Minor rack and pinion. Also known as the Nisonger KLG Special. I found a few more references and an exact (or very close) looking car to your picture and it is again called the Mk2 in another book called "Road Racing Specials" by Vintage Motorsport. Originally a fiberglass body, converted to alloy. It was raced in Engand by Sadler and brought back to the states and then raced in the U.S. at Pomona, Watkins Glen, etc. There is a picture on page 155 of that book showing Bruce Kessler driving it at the 1959 L.A. Examiner Grand Prix. They are calling it the MK II and it was sponsored by the Nisonger Racing Team for that race. There was both a Mk II and a Mk III Sadler. Can't tell you which is which, but I seem to recall that the Mk III was a bit lower with more pronouced fenders. Need help here from someone from the Eastern US and Canada who saw the things run and may have photos. Bill Sadler now lives in Florence, Oregon...I'll contact you. Back in the late 1950's Bill Sadler came to England and worked for John Tojeiro building the Tojeiro racing cars. Julien Majzub was racing his Sadler, that was brought into England a couple of years ago, just last week. Cup Formula Libre race at Watkins Glen. David is correct, it was Caddy powered. I find the Sadler to be an exquisite design. Most evocative in its stance, backed by the superior experience and knowledge of Bill. I had never seen these cars before, but much like the birdcage, and other similar designs, it gets my attention, and i think thats half of the fascination for me with regards to low production/prototype race cars. Thanks again everyone, and thanks Vince!! Bill Sadler and his cars deserve to be seen on this forum. Dave Greenblatt has sent this group from his photo collection for the members to enjoy. Here is Dave Greenblatt's good friend Peter Ryan in the Sadler Corvette powered Formula Libre car. "I raced against Bill Sadler in 1959 at Harewood Acres, Ontario, Canada. Bill driving the Mk2 and me in a 1959 Competition Corvette from Gorries/Chevrolet. The Sadler Mk 2 passed me down the back straight like I was stopped. 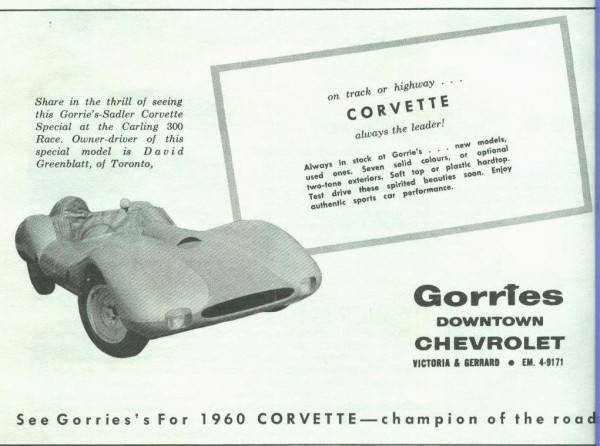 In 1960 Bill Sadler built the Mk 1V for a real estate company from Montreal for me to drive, sponsored by Gorries/Chevrolet and Firestone from Toronto. I won the 1960 Quebec Drivers Championship in this car in my second year of road racing." photo lent site Dave Greenblatt collection. Another view of the Sadler mk 2. Bill Sadler and Dave Greenblatt co-drove the Sadler Mk4 at Watkins Glen in the 1960 International formula Libre Grand Prix. This was an invitational event made up of F1 and Group 7 sports racing cars Moss and Bonnier and Gendebien and Brabham and many other great drivers were in attendance. Bruce Kessler driving the Mk3 Sadler, car#3 at Pomona , California. Paul O'Shea is in the #4 car. photo lent site Dave Greenblatt. Sadler Mk 4. This is from 1960 with Dave Greenblatt doing the driving. This car had a Latham supercharger on it. This was at Watkins Glen in a Formula Libre race event. This is the car that gave Dave Greenblatt and Luigi Cassiani the inspiration to build their Dailu Special. Bill Sadler and a couple of his brood at Monterey, 2003 are in the last row or three. Wow, thanks Jerry and Frank. Those are great photos. Please thank Dave for his contribution. Julian Majzub spinning his Sadler Mk III at Donington 2006. Is this the same car which features in raceannouncer's post (Chassis 002)? Dave Greenblatt and crewman on magazine cover. Dave Greenblatt was 20 years old when he met Bill Sadler. He hasn't really stayed in touch over the years. Dave Greenblatt feels Bill Sadler was on the cutting edge of race car design in the 60's. He feels he was a very talented individual and had the utmost respect for his abilities and that Bill Sadler was a very innovative designer. Dave Greenblatt says " Thanks, Bill for the inspiration at my young age of 20." Dave Greenblatt on the starting line. This was the 1961 Annual Hill Climb event held at Keene, New York. Dave and the Sadler were first overall. Dave Greenblatt driving the Latham Supercharged Sadler Mk4 at Mosport in June of 1961. This was the first race held there. The race was called the Players 200. Players is a Canadian cigarette company. This car was sponsored by Gorries Chevrolet. After looking at this site, Dave Greenblatt says: "It is ashame that we did not keep up some form of communication over the years." This is from Bruce Kessler: Bruce's first recollection of the Sadler Special was at Nassau in 1958. "The car was extremely quick but could not finish, and I don't think it led any events. The main event was won by the Scarab Team and if my memory serves me correctly I think the car was driven by Lance Reventlow and Chuck Daigh. I won the Ferrari Classic driving John Edgar's big red 4.9 that Shelby won so many races with, and Ricardo Rodriguez was 2nd driving for North American Ferrari (Chinetti). I believe this was the last race the 4.9 won before being put into retirement. The day after the Victory banquet they had a special first Jet flight from Nassau to Miami or NYC. I can't remember where, but they put the drivers and owners on this flight. Sitting behind me was a man old enough to be my grandfather (I was 22) whose name was Earl Nisonger. He owned the Sadler Special and was the KLG spark plug distributor. He started kidding around with me about driving his car, which at the time I had no interest in because of my commitment with Ferrari and Scarab. The Herald Examiner in Los Angeles announced that they were going to have a race too equal the Times Grand Prix in February of 1959 promoted by JC Agajanian. At the Pomona Fairgrounds course. And invited drivers from Europe ect. Ferrari North America did not have a car suitable for the course and Phil Hill did not compete and Lance Reventlow decided to retire his cars. Chuck Daigh decided to drive Bill Murphy's Buick Kurtis. And when they put pressure on me to drive I declined saying that there was not a suitable car avaliable. When Aggie pushed me further I said that I might drive the Sadler if it was avaliable. The next thing I know Mr Nisonger is sending out a 2 car Team with myself and Paul O'Shea as drivers. Paul O'Shea and I co-drove the winning GT Ferrari for North American Ferrari at Sebring in 1958. I was given my choice of cars and got to bring my own pit crew chief. I decided to drive the older car with the pre selector gear box that I had seen at Nassau since the new car was brand new and had no time on it. I chose Harold Daigh, Chuck's brother from RAI-Scarab, as my crew chief and Lance Reventlow to run my pits. I had driven a pre selector gearbox in a F1 Connaught in qualifying at Monaco and did not care for it at all but I thought the tried car had a better chance of finishing." "I met Bill Sadler on the first day of practice and qualifying. Mr Nisonger had not come out for the race. The new car was very impressive looking, but I can not remember Paul's impressions of it. You could not help but like Bill Sadler and he said the car was ready, so I climbed in. I started familiarizing myself with the car and was immediately aware how fast the car was, when the engine quit, fortunately I was able to coast back to the pits. Bill Sadler said he knew what the problem was and it was not long before I was out on the track, but by the start of the second lap the engine quit again. We had two more exact repeats and were not able to complete our qualifying laps. Aggie came over to our pits and said if I could win the consolation event that afternoon he could add me to the main event on Sunday, since I was an invited driver. At that point Harold Daigh asked Bill Sadler to see if he could solve the problem. Bill said have at it. What I believe Harold found was that they had been welding around the carburetors and weld material had gotten into them clogging some of the jets, but giving it enough fuel to run over a lap before it would run out of fuel. Anyway we rolled her out to the starting line and everyone crossed their fingers collectively and when the flag went down I realized that by the time I was braking for the first corner that I was leading by half the distance of the straightaway from the starting line. All I had to do was drive as slowly as I could and not break it, and there was no way even then that anyone could catch me. Well that is what I did and when I pulled into the winner's circle and they gave me the checkered flag for the victory lap I said no, I was not going to chance it failing on the Victory lap. When we got back to the pits I told Bill Sadler and Harold Daigh and Lance that I thought we could win on Sunday. I told Harold to look at the chassis because the car felt like the chassis was flexing or trying to lift a wheel when I got on it hard coming out of a corner and maybe something was broken." Sunday morning Harold said he had repaired a lot of cracks on the chassis and asked me if I was breaking or accelerating on any bumps. I said of course, and he said he understood, but if I got the chance back off on them. "I was the last car on the grid and I told Lance Reventlow that all I really cared about was where Ken Miles was, because I thought he was the car to beat. He was in a 550 RS Porsche on this tight circuit." " Arnie Kane was the starter and when he made his run down the grid and finely getting to me at the very last spot he looked down and pointed to the fact my seat belt was laying in my lap unbuckled. I started to buckle it and he turned and started his run back. I had been driving in Europe and harnesses had not been invented yet and they did not believe in seat belts and neither did I, so I never finished buckling up. I don't remember much of the race, but in the first 5 or 9 laps? I went from 30th to 5th or 7th, I remember looking for a pit signal to tell where I was and where Ken Miles was, but all I got from Lance was a big grin and a signal that said call your mother. Then as I came on the front straight I saw Chuck Daigh pull out and pass Max Balchowsky in Ol Yaller at the start finish line and get a little loose doing it. I was accelerating hard as I approached the start line changing up a gear and that is the last thing I remember. What had happened was Max Balchowsky in Ol Yaller had blown his engine and Chuck Daigh had just caught a tiny bit of oil from it and shifted in Max's oil before they got the oil flag out. The race was won by Ken Miles as I thought it would be. I came through and I shifted in Max's oil. I was unconscious for four days, and there you have my recollection of the Sadler; a very very fast special." Bruce Kessler has never spoke on any forum before. He has enjoyed seeing this thread on the Sadler and wanted to tell the forum members his experiences with Bill Sadler, whom he admires and the Sadler Special.
" Bruce Kessler has never spoke on any forum before. He has enjoyed seeing this thread on the Sadler and wanted to tell the forum members his experiences with Bill Sadler, whom he admires and the Sadler Special. Glad you enjoyed Bruce's experiences with the Sadler, David. His Accident happened at the end the 9th lap. It took place at the start finish line. Also making the main event through the consolation race was Bob Oker in the Hans Davids, Aston Martin DB3S, Skip Conklin offered his Lotus 11 to Roy Salvadori for the feature and Mark Cummings in a Corvette Special and Bob Schroeder in a Maserati 300S. Only Tony Bettenhausen in a slow Ferrari 121LM seems to have recieved a free pass by JC Agajanian, since he was paid appearance money. Four other qualifiers had mechanical problems on Sunday. They were Ebb Rose, Roy Salvadori, Billy Cantrell and Chuck Howard which allowed the fastest cars in the Consolation race to enter the feature. all research on race by Willem Oosthoek. This was the last professional race Bruce Kessler was ever in as a driver. They told him he couldn't drive for a year and shortly after the accident he was offered a job at MGM as a technical advisor on a racing film and his life changed direction. It was the general consensus of opinion that day at Pomona that there was no faster car on the circuit than the Sadler with Bruce driving. This is from Bruce again: " I can still see Warren Olson (head of the Scarab Team) known for very rarely showing any emotion, grinning at me as I lay in a hospital bed saying something to the effect of nobody believed how fast you came up through the field. Lance was getting ready to start collecting bets on how far you would be in front before the race was over and or the car quit or which ever came first." WOW!!! Thankyou Jerry for relaying the info and a big thankyou to Bruce for reliving some fond memories. Nice to read about my Sadler cars here. I'll be back soon with comments. Oh, even bigger WOW .This thread is getting better by the minute. A big welcome to TNF Bill. I look forward to reading your comments. I've just sent you a letter actually, being unsure whether you had access to the internet. I snapped this pix at Mosport circa 2004-2005 during the annual VARAC meeting in late June. Owner Jack Boxtrom stands behind the car in the light blue shirt. A very advanced design for its time. TY, Bill Sadler! Here are a couple of pics that may be of interest. The car in the lower photo is the F.Junior which Stephen Bulling currently races. A pic of Dave Rodgman in the Sadler MkI. Dave bought this car and raced it in the original condition until he wrote it off. One of his buddies said that the car was too short to handle properly so the car was rebuilt and lengthened and given an aluminum body and Corvette power. Dave thinks that he sold it to a fellow named Dampier but has no idea where it ended up. This is from the Carling 300 of 1960 race program. Edited by Jerry Entin, 28 January 2010 - 18:33. I have taken the liberty to post Daniel 49's photo of the Sadler onto the Sponsor & Supply Vehicles thread. The Austin / Morris J2 Lucas van will be of interest to those who regularly visit there. If anyone knows where the photo was taken would they be so kind as to post that info onto the thread. are right that it's Bob Said at Nassau. Does anyone know of who did the original of this drawing? I have a feeling it was in one of the magazines back in the day. Was there a color version? of the body will be all new and will be fitted properly as a stressed skin. Island Concours with the car in March 2013, so I'll be busy until then...."
Also, there are some Sadler photos on ebay that I mentioned to Bill. 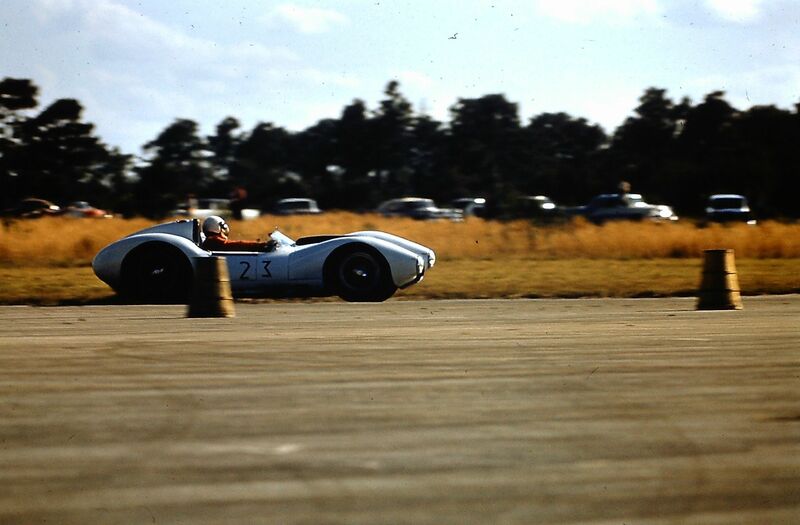 They are of Tommy Friedman in the Mk 3 at Courtland, Alabama in 1963. Who was Tommy Friedman, and which Ferrari did he race in 1964? Willem? Jerry? Edited by raceannouncer2003, 15 October 2012 - 21:54. ...shot at Spa Six Hours meeting in 2008. I've just realised that as editor of the Midget & Sprite Club's magazine "Mascot" I should have know about the Sadler Formula Junior based largely on the early Austin Healey Sprite running gear. Please could someone enlighten me or at least point me in the right direction as our magazine has been running for 30 years and I'm certain that no mention of the Sadler Formula Juniors has ever been made. Bill Sadler now lives in Florence, Oregon where he has a business making Micro Light planes and drones. There is a web site, but I have lost the URL. Bill with wife Linda, and daughter Vicki, who came from Mystic, Conn. to see him race. She'd like to start racing, too. They were thrilled that Bill won the Pete Lovely Spirit of Vintage Racing Trophy, presented by Al Unser, Jr.
Bill in car talking to Myles Winbigler, owner of the green and white Sadler. Byron Sanborn, in the background, drove Myles' car. Byron said it was "a hoot". The green Sadler had clutch problems later on Saturday, but was running again today. Bill's car had to retire later on Saturday with a holed piston. Gary, I will give Bill your email address. Wonderful Vince, very many thanks. Great images too. Cocoa-Titusville, February 1959. Bill Sadler in a rare Florida appearance with the Sadler Mk 3. He retired from the race and Joe Sheppard [Porsche 550RS] fisnished 1st overall..
Edited by Jerry Entin, 20 October 2013 - 21:45. As part of my TVR research I've been sent a photo of a Jomar which was rebodied in probably 1959/60 by Sadler. The Jomar was owned / raced by Johnny Boyd of Buffalo. Does anyone have contact details for Bill Sadler so I can send the photo and see if he has any recollection.